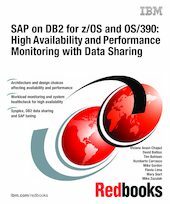 This IBM Redbooks publication addresses the challenges posed by monitoring high availability, scalability, and performance in an SAP sysplex data sharing environment. It introduces the motivations for utilizing a design based on DB2 data sharing. It includes the principal SAP-DB2 data sharing architecture options and trade-offs used in the industry today and issues that play a role in both high availability and scalability, such as failover design, database connectivity design, workload splitting and load balancing, MCOD, and coupling facility design.